Jane Exclusive Colors lace front wig by Jon Renau ® is a classic short cut. Longer layers along the top and sides create beautiful volume, and fullness. Shorter layers along the back and nape frame the neck perfectly. Jane Exclusive is made with top quality Remy Human Hair that looks and feels incredibly healthy and shiny. Human hair also offers endless styling versatility. Smart lace  and monofilament features allow for styling away from the face and multi-directional parting. The hand tied construction allows each hair to swivel freely for natural movement and believability. Jane is fresh, breezy, and the definition of luxurious. Jane Exclusive is available in Renau Natural as well as rooted Colors. • Remy Human Hair- Highest quality human hair looks, feels, and moves beautifully. Offers incredible styling versatility. • Smart Lace  - Ready to wear lace front mimics the appearance of a natural hairline and allows for styling away from the face. • Monofilament  Gives the illusion of a natural scalp and allows you to part in multiple directions. • Hand Tied Cap Construction- Allows each individual hair to move freely like natural hair. To protect your human hair investment we recommend BeautiMark  styling and care products. 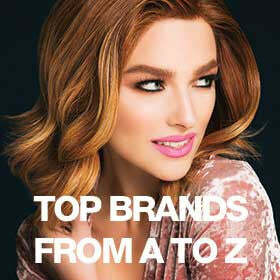 BeautiMark  is specially formulated for human hair wigs and extensions. We recommend washing and styling human hair wigs prior to wearing. To best preserve the style and life of your wig we recommend placing your wig on a folding wig stand when not in use. Approximate Length: Front 4" | Crown 5.5" | Sides 3.75" | Back | Nape 1.75"